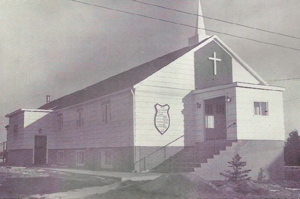 The History of the Digby Wesleyan Church 1959 thru 2007 . . .
_______________________________________ August 1959 . . .
Reformed Baptist tent meetings, with Randolph Nicholson, Evangelist and Paul Mullen, Song Evangelist. The tent was pitched across from the legion. Converts in those two weeks were Victor and Arlene Freeman and Gertrude Lettney. After the tent meetings we rented a hall where the Venture Centre is now. Rev. Gerald McKinnon was Pastor of the reformed Baptist Church in East Ferry. He came up twice a week to have services. Rev. Merrid Grant (ret.) and family, Hubert Marshall and family were those already here. All of the churches in this District sent $10 a month for two years to help pay the expenses. _____________________________________________ 1960 . . .
Rev. George Hopkins came in 1960 to East Ferry, and he came and had the services in Digby. We bought the lot where our church is, while he was here. The Charter Members were, Rev. & Mrs. Merrid Grant, Charles Grant, Esther Marshall and Victor & Arlene Freeman. _____________________________________________ 1962 . . .
Rev. Hollis Kimball came in 1962. He lived in East Ferry and came up for services. While he was here we put in the basement and moved from the little hall into the basement (of the current building). _____________________________________________ 1964 . . .
Rev. Hazen Ricker came in 1964. We bought the house next door for the parsonage. Hazen remodeled the house and also built the first level of our church. Hazen Ricker was the first pastor to live in Digby. During this time, gerald Budd donated the logs to be sawed into lumber to build the top floor of the church. The men of the church would go saturdays and cut the logs. We got most of our materials from C & M Products. Then the men would go Saturdays and cut pulpwood that was donated. This was taken to C & M and traded for our finish materials. _______________________________________ 1968 to 1980 . . .
Rev. Charles Bain came in 1968 and left in 1974. Then Rev. Doug Hapeman came and was here until 1976, when he left Rev. Walter Fernley came, while he was here we built the back piece on the church from the kitchen back. When the back was built on the church the logs where donated by Ruth Speights. Also while Fernley was here Brian Bradley was here for a year as an assistant. _______________________________________ 1981 to 1997. . .
Rev. Ervin Lively came in 1981 and was here until 1985. When he left John Den Hollander came. John Den Hollander built his own house while here, and we started renting the old parsonage. We rebuilt the basement inside while he was here. Also we built the new entry way on the front. Pastor Tim O'Blenis came in 1992 and left in 1997. ______________________________________ 1997 to 2000 . . .
Pastor Tim Guptill came in 1997 and left in 2000. In the spring of 1997 we built the new parsonage on Bel Air Drive. We remodeled the upstairs (the sanctuary and offices) while he was here. Rob McDowell was the youth pastor. Also, Jason McCutcheon was came to help out as a summer student. While Pastor Guptill was here we purchased the lot behind the church from Seamore Raymond and enlarged our parking area. _______________________________________ 2000 to 2004 . . .
Pastor Brock Symonds came July 2000. _______________________________________ 2001 to 2010 . . .
Pastor Jason McCutcheon came on staff as the Youth and Music pastor in January 2001 and served until December 2010. In 2009, the old parsonage was moved from the property on Victoria Street to make more room for parking. A.J. Cole took it away in two pieces. ______________________________________ 2004 to 2016 . . .
Pastor Andrew Maves came as Senior Pastor in July of 2004. In 2006 we went to two services on Sunday. Stephen LeRoy joined the staff late in 2011. 2012 we sold the parsonage on Bel Air Dr. and payed off all loans incurred from the church renovations and the property purchase of '97. In 2013 we added a bathroom upstairs that was wheel chair accessible. In 2014 we renovated the bathrooms downstairs and added a bathroom to the nursery. In 2015 we launched "Biker Church" on Tuesday nights! We have the service in the sanctuary around the tables. Coffee and treats add to the relaxed atmosphere. The music has a little more of an 'edge'! It has become a very successful third service. Tim Long came on staff to work with our teens and student ministries. In 2016 he felt a call to minister down the neck. Tim took leadership of the Pentecostal church in Tideville. It was re-launched in January 2017 as "Live Well Community Church". ______________________________________2017 to Present... Curtlen Peck has joined us and is looking after our student ministries while pursuing a 'full time' call to ministry. Allyson Maves is helping out with the music program. A special thanks to Victor Freeman for the history of the Digby Wesleyan Church. Victor passed away Sunday, May 27, 2007. We miss his smile and handshake.